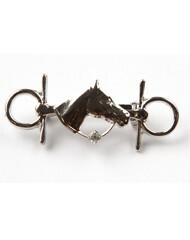 Snaffle Bit with Horse Head Stock Pin with Swarovski Crystal details. Beautifully detailed stock pin in Silver Plate. Used to secure a ready tied or traditional hunting stock, the stock pin is an essential piece of showing kit.